Question: I use GIMP image editor regularly. I would like to customize its default settings to my liking, so that I don't have to change GIMP settings every time I launch it. How can I change the default settings of GIMP permanently? First, go ahead and customize the default settings of GIMP as you wish, e.g., default foreground/background colors, default font, default units, etc. To save the current GIMP settings, go to "Edit" -> "Preferences" menu. In the "Preferences" window, click on "Tool Options" in the left hand sidebar. Then click on "Save Tool Options Now" button. At this point, the current GIMP settings will have been changed permanently, and the next time you run GIMP, you will see the same current settings. 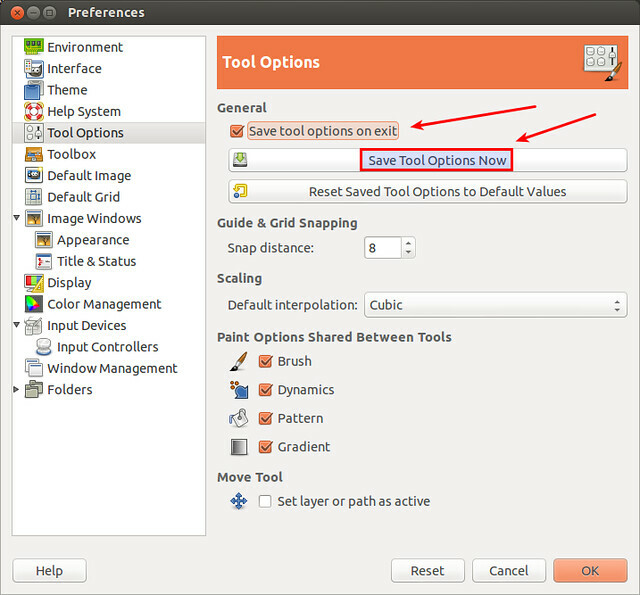 Optionally, you can also click on the checkbox of "Save tool options on exit". That way, any change in GIMP settings will automatically be saved upon exit, without you having to save the change manually.